fill what would otherwise have been a hole in the page. As his topic, he chose the little ironies of everyday life. The first They'll Do It Every Time appeared on February 5, 1929, and it ran for decades after. For seven years, Hatlo did the series just for that one paper. 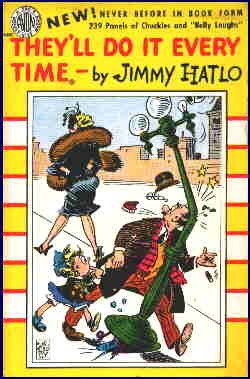 In 1936, King Features Syndicate picked it up and gave it national distribution. It was an immediate hit — in fact, it became so popular, its name became a common catch-phrase, like that of Arthur R. "Pop" Momand's Keeping Up with the Joneses. A memorable feature of Hatlo's panel was the "tip of the Hatlo Hat" that appeared in the lower-right corner of the panel. Hatlo often used readers' suggestions, and always took the trouble to acknowledge it with a drawing of himself tipping his hat. They'll Do It Every Time didn't have any central characters, but a few turned up in repeat episodes. Henry Tremblechin was a frequent victim of the daily irony, and his co-workers and family became familiar characters. Tremblechin's young daughter, Little Iodine, was spun off into a strip of her own in 1943, and also held down a Dell comic book from 1949-62. Hatlo died in 1963; and his assistant, Bob Dunn, took over the operation. The feature was named "Best Panel" by the National Cartoonists' Society twice during Hatlo's tenure (1957 and '60) and three times during Dunn's (1968, '69 and '79). Following Dunn's 1989 death, They'll Do It Every Time was taken over by his former assistant, Al Scaduto, who still asknowledged readers' suggestions, but no longer with a "Hatlo Hat". Scaduto kept up the same drawing style, which looked increasingly old-fashioned, until his own death on December 7, 2007. The last daily episode he'd done was dated February 2, 2008, and the last Sunday Feb. 10. At that point, nearly eight decades after it started, King Features elected to fold the series rather than hire a replacement. Text ©2001-08 Donald D. Markstein. Art © King Features Syndicate.